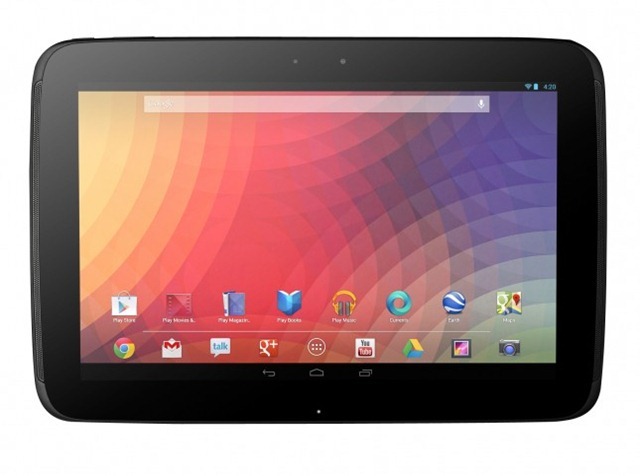 Along with Nexus 4, Google also announced Nexus 10 tablet. It runs Android 4.2 Jelly Bean on Samsung Exynos 5 dual-core processor, It has 2GB RAM. Samsung’s new Cortex A15-based Exynos 5 Dual 5250 chip clocked at 1.7 GHz, and its quad-core Mali-T604 GPU helps to drive a 10.055-inch PLS display with a resolution of 2560×1600( 300 ppi) has four times the number of pixels in a 1280×800 screen and edges out the Retina iPad’s 264 ppi. It has 5-megapixel rear camera and 1.9-megapixel front facing camera, Nexus 10 powered by 9000mAh battery. The Nexus 10 will be available in 16GB for $399; 32GB for $499; available on November 13 in the Google Play Store in U.S., U.K., Australia, France, Germany, Spain, Canada and Japan. 1.7 GHz Cortex A15 based Exynos 5 dual-core processor, 2 GB of RAM. 10” WQXGA touchscreen with 2560×1600 resolution at 300 ppi. 5-megapixel rear camera and 1.9-megapixel front camera. Bluetooth 3.0, Wi-Fi (MIMO+HT40), micro USB, microHDMI, Pogo pin, Dual Side NFC, Assisted GPS (Glonass). Barometer, Accelerometer, Gyro, Digital Compass, Light sensor. 16 / 32GB internal storage. 9000 mAh Li-ion battery, provides 9 hours of video playback and over 500 hours of standby time. Video support: Codec: MPEG4, H.263, H.264, VC-1, DivX VP8, Formats: 3GP, MP4, WMV(ASF), AVI, FLV, MKV, WebM, Full HD(1080p) Playback & Recording @ 30 fps. Audio formats: MP3, OGG, WMA, AAC, ACC+, eAAC+, AMR (NB, WB), MIDI, WAV, AC3, FLAC. 3.5mm audio jack, Stereo speakers. Measures 10.38” (l) x 7” (w) x 0.35” (d); weighs 603 grams.